The Iran deal will provide the Islamic Republic with an estimated $140 billion in sanctions relief and unfrozen assets. Iran currently spends 3.4 percent of its total budget on defense. Iran spends 65 percent of its defense budget on the IRGC, its elite paramilitary force that actively supports terrorist organizations throughout the Middle East. 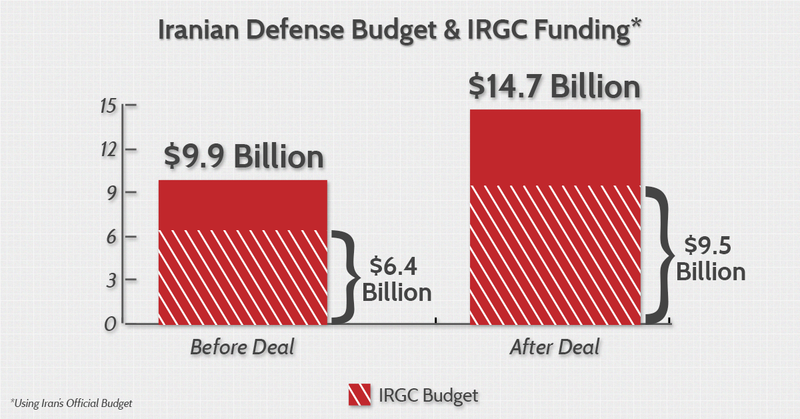 If current budget trends persist, the Iran deal would mean at least $4.8 billion in additional Iranian defense spending and a 50 percent budget increase for the IRGC. The recent Iran deal provides relief from international economic sanctions in exchange for certain limitations on Iran’s nuclear program. Upon implementation of the deal, a substantial amount of money would flow to the Iranian government, although the total amount is the subject of much debate. According to initial reports from U.S. officials, Iran would have access to $100 billion of frozen assets. The Under Secretary of Treasury for Terrorism and Financial Intelligence cited this same figure in congressional testimony earlier this year. Secretary of State John Kerry later walked this number back to around $50 billion, reasoning that half of Iran’s frozen assets were already obligated to various projects. While Iran may have already decided how to allocate some of the windfall, it does not reduce the amount they will receive from sanctions relief. President Obama himself has used a much larger figure, however, citing Iran’s $150 billion in offshore assets in a recent interview. The Israeli Ambassador to the United States has also publicly stated that the deal would give Iran $150 billion. The ultimate unfrozen assets figure is likely to be somewhere between $100 and $150 billion. A reasonable estimate from Foreign Policy is that Iran will receive an initial influx of $120 billion in unfrozen foreign assets and $20 billion in additional annual oil revenues – totaling $140 billion in the first year. Iran’s military spending is also unclear. President Obama has said Iran’s defense budget is $30 billion. Two independent estimates, however, have concluded Iran spends anywhere from $12 to 14 billion (the United States Institute of Peace) to almost $18 billion (the Center for Arms Control and Nonproliferation) annually on its military. While it is unlikely that Iran accurately reports its military spending, it is informative to consider the country’s official budget as a minimum. This year, the Iranian government reported that it will spend 3.4 percent of its total budget on defense, which amounts to almost $10 billion. Iran reports that it spends 65 percent of its defense budget to fund the Islamic Revolutionary Guard Corps (IRGC), the Iranian elite paramilitary force. That works out to 2.2 percent of its total budget or over $6 billion. The IRGC actively supports terrorist organizations throughout the Middle East, such as the Houthis in Yemen, Hezbollah in Lebanon, and Hamas in Gaza. Iran also sends billions of dollars and provides military assistance to Syria. A spokeswoman for the United Nations recently estimated that Iran spends $6 billion per year to support the regime of Bashar al-Assad. The international nuclear agreement with Iran would initially provide a $140 billion economic windfall to the Islamic Republic. Of course, not all of the money would go directly to military spending and terror finance, as Iran has a variety of existing contract obligations and domestic spending needs. It is important to remember that much of Iran’s financial support for terror remains off the books. Iran’s official budget, however, reveals the minimum amount the country spends on the military and the IRGC. If current spending trends continue, the $140 billion windfall would mean at least an additional $4.8 billion in defense spending. Of this, $3.1 billion would go specifically to the IRGC – amounting to a 50 percent budget increase. Nothing in the deal would prevent Iran from spending more than that to fund their military or terrorist organizations and authoritarian regimes throughout the Middle East. Already this summer, Iran’s supreme leader, Ayatollah Ali Khamenei, ordered that the Islamic Republic would increase defense spending to at least 5 percent of its budget.